This is the reverse of the programme. The popular Canterbury Theatre of Varieties was the first of the great music halls. 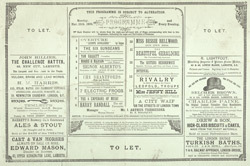 Opened in 1851 and reconstructed in 1876, the building featured a three-tier theatre, entrance hall, promenade and lounge - all of which are presented on the cover of this programme from 1889. The entertainment that evening followed a typical pattern and included a variety of acts. There might sometimes be over 20 of these in one evening. Well known names such as Bessie Bellwood (1847-1896), famous for her cockney humour and rousing songs, and Jenny Hill (1851-1896), known for her energetic style of singing and dancing, might be listed alongside such novelties as the seven electric frogs direct from Paris. It is interesting to see how the printer of this programme has generated some extra income by filling the vacant spaces with a variety of advertisements.